There had been a fair amount of debate between Scott and I on whether it would be a good idea to go ballooning and boy did we ever make the right decision. First there was the cost (200 euro each holy crap! ), then the fact that they pick you up at 4 freaking am, and finally that one of us is afraid of flights and the other of heights. Every person we spoke to gushed about the experience so we said a couple of Hail Marys (ok, not really) and took a chance (really). Why these people collected us at 4am is a mystery. From our hotel we were taken to a place where we were served a ridiculously enormous bang-up buffet breakfast, complete with food sculptures in amongst the dishes. And there were droves of people. Really it felt like every man and his hungry pushy cousin were there, all shoving each other out of the way so that they could be the first to get to all the food. Who the bloody hell are all these pushy people scooping up plates of rice and soup at 4.15 freaking am, I wondered, and who can even eat at that time of the morning?! I would soon get to know them a little more intimately when I would be crammed into a basket alongside 16 of them. But my crusty cranky mood was diluted after they cleared a path between me and the coffee machine. Probably if I didn't know me, I'd have been terrified of me at that moment too. There are multiple balloon tour operators in Cappadocia, so we went with Kapadokya Balloons who were recommended to us by our hotel. The guys in charge of manning our balloon were such fun, all joking around and playing the fool (a fact which I appreciated more after the flight than before). There were probably about 30 to 40 minibuses parked outside the strange breakfast building. The hungry 5 thousand were divided into groups and directed to the appropriate minibus. Our friendly pilot was a chap named Andrew. I'd thought to myself how unusual it was for a Turk to be named Andrew but he soon revealed himself to be a Kiwi. When we arrived at our baskets there was light in the sky (as opposed to being in complete darkness like when we were collected and fed) and we watched as our balloon was inflated. Nice, we got the Mercedes! I made a video of this with my cellphone. My stomach butterflies were growing more violent and vicious by the second. They had developed acid-coated fangs and were bloodthirstily ripping and tearing their way through my delicate gizzards. I stopped caring about the hungry 5 thousand, and the earliness, and the chaos and now centered on the here-and-now and the fact that I would be climbing into a wicker basket tied to a balloon, and with nothing between me and the ground. What in the world were we thinking we are going to die on our honeymoon AAAARRRRGGGGHHHH!!! I looked over at Scott who looked calm and un-phased (does he ever not?) and tried desperately to disguise the fact that I was freaking out. Based on the photo below I was able to do this fairly successfully, but I knew that the ground staff could smell my fear. I was expecting a violent jolt and to go catapulting off into orbit. What actually happened was a gentle, floatey, flying day-dream. I liked this! 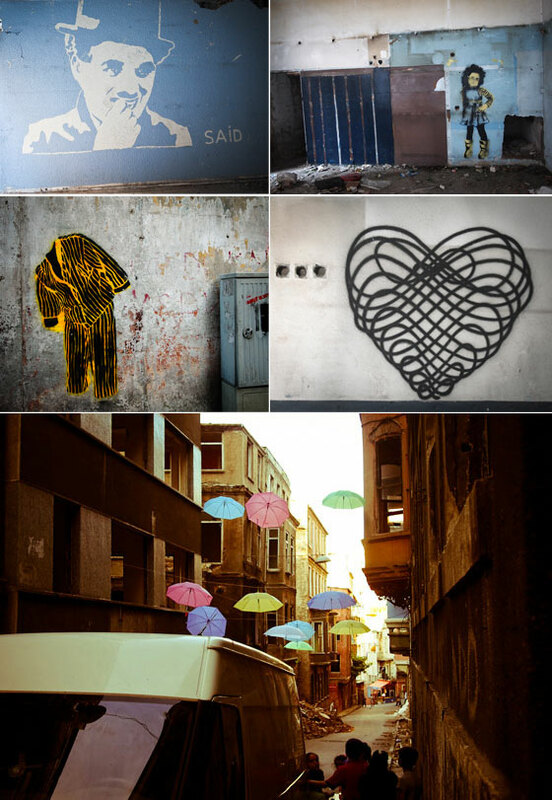 No… I loved this! The acid-fang butterflies were extinguished by a wave of peace and calm (and probably relief). Up, across, up and away we floated. Things got smaller and smaller at a very slow un-terrifying rate and I couldn't take my eyes off of what we were above. Andrew didn't have a lot of control over which direction we floated in, but he was in complete control of our height and the orientation of the balloon which meant that everyone in our group got a fair chance to view all directions because we were constantly being rotated. When we eventually descended it was straight onto a flatbed trailer that the ground team had parked in the field that we came down in (they remain in constant contact with the balloon pilot to figure out where to pick us up). As we were landing, one of the team gave me and all the other ladies in the basket a little flower that he'd picked in the field we landed in. While the balloon was being deflated and folded up we were served a glass of Cappadocian champagne, and Scott and I were given a bottle tied with a ribbon as a gift because we were the honeymoon couple! :) Right as I'd finished my drink, I was scooped up by the flower-giving balloon man and tossed onto the deflated balloon, presumably to help get the remaining air out. I was joined shortly by 3 more of the girls from our ride and it all made for a lot of hilarity and confusion and I nearly booted someone in the face. 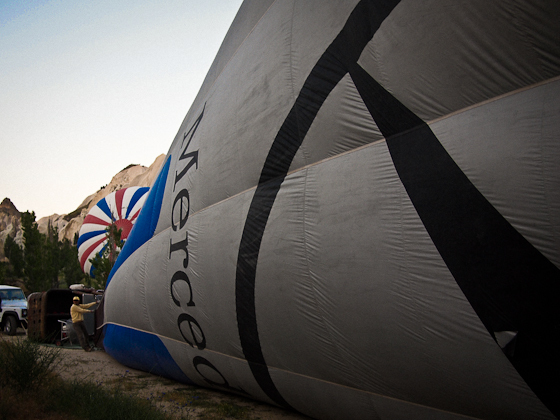 This ballooning experience was a unique one. I felt unlike any other time in my whole life, and so did Scott. It was incomparable, magical, wonderful and the closest I will ever be to having lived a dream. One would have thought that we'd have learnt our lesson about visiting popular tourist sites at noon but evidently we had not. I suppose one is quick to forget the crappy parts of an excursion. 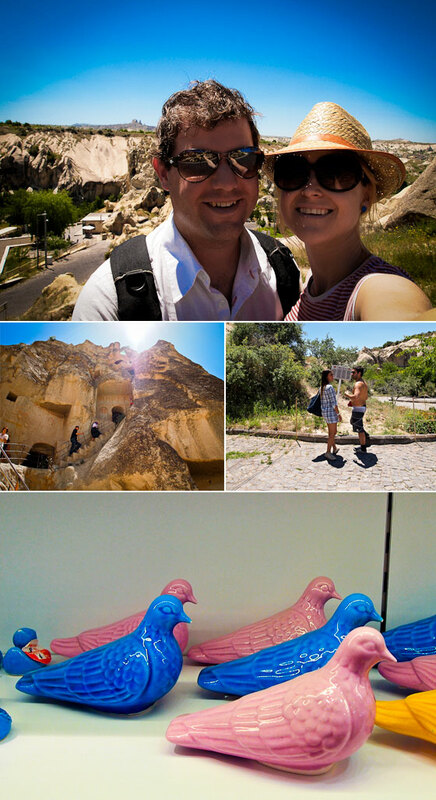 We'd decided to visit the open air museum of Göreme, like fools, on one of the hottest days since we'd been in Turkey, at noon. 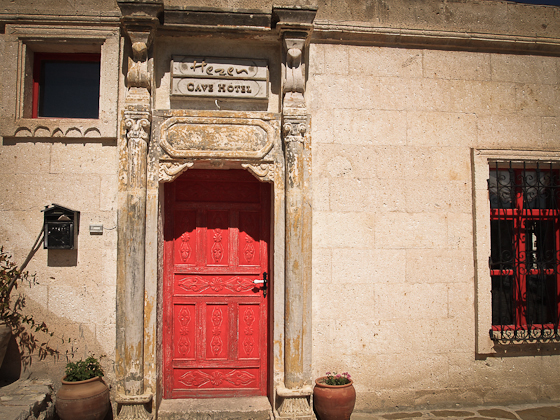 First I should probably mention why Göreme is special and why every single visitor to Cappadocia will probably visit it before visiting anywhere else: it is central, and confirmed to be one of the oldest sites in the region. 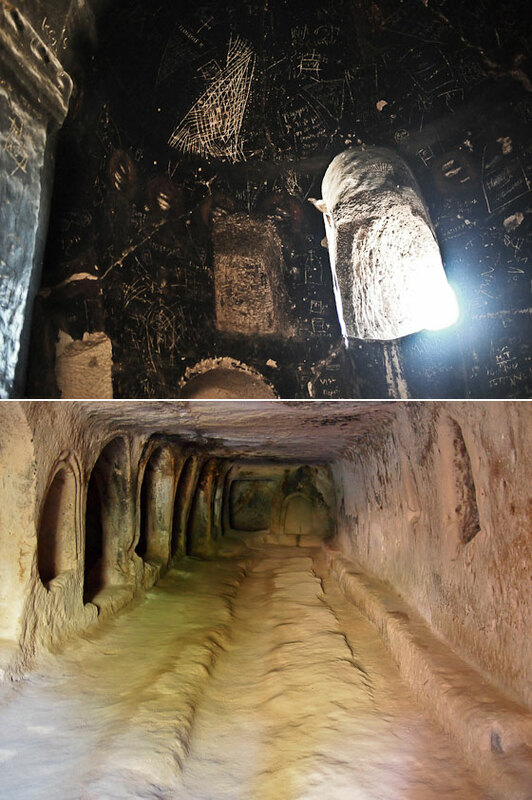 According to my Cappadocia guide it was mentioned in a book from the 7th century (called The Doings of St Heiron). 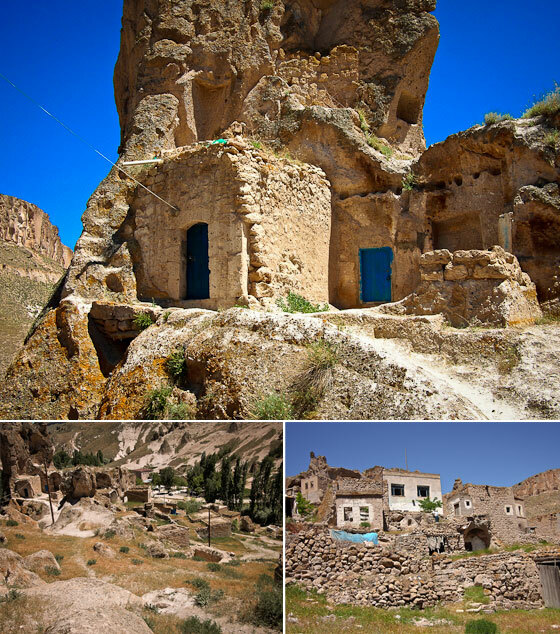 The open-air museum is a closed-off region that you buy a ticket to enter and it is dense with caves, many of them churches, and nearly all lined with ancient frescoes that were painted from the 6th century onwards. That's very old, and people love old churches. Perhaps we were still spoilt from the multitude of activities on the day before because we found this museum to be very hard work. After queuing to get in, one has to queue again to get into the individual caves and it was filled with the bad kind of tourist who are pushy and selfish. The audio guide was comically bad. 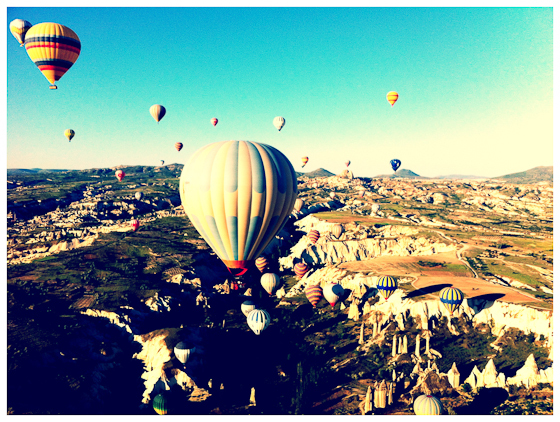 It had a slow-talking British announcer who painfully mispronounced Cappadocia each time. I was sure that Scott was going to crack under the circumstances any moment and insist on leaving and waiting for me in the car park but he held it together very well. Scott is a highly patient person but he has his limits. We measure Scott's ability to go on in a museum in what we call his 'museum calories'. He has a limited amount of museum calories and each time someone shoves into us or we have to queue to see something, the calorie depletion rate rises rapidly. Once there are no more calories, you'd better be ready to beat it out there in a hurry or risk a crisis. Calories may be topped up with beer (in some cases), or a quiet and cool place to sit that has internet access. But not a whole lot else. I think Göreme came dangerously close to running him into a calorie deficit.. 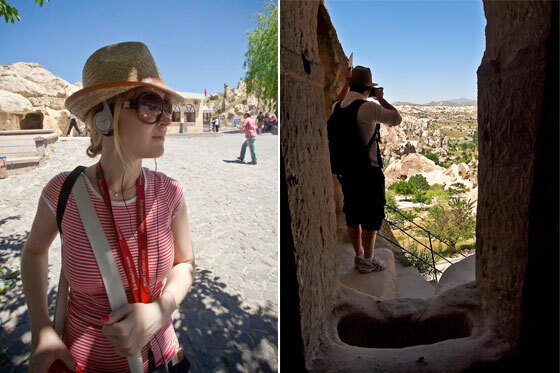 In all our sightseeing in Cappadocia so far we'd felt frustrated at the lack of information provided about what we were seeing. There are a lot of information placards that have been translated from Turkish to English (albeit poorly… Turklish?) but nearly all of them are focussed on informing us of the religious meaning behind the sites rather than the historical or geological. For example, telling me that Saint Joe is said to have passed through this valley is far less useful than explaining, for example, that people from Iran and Saudi Arabia migrated through in the xyzth century. We'd bought a little book to try and get around this and have more info, but it turned out to be fairly limited in its information and also written in Turklish. 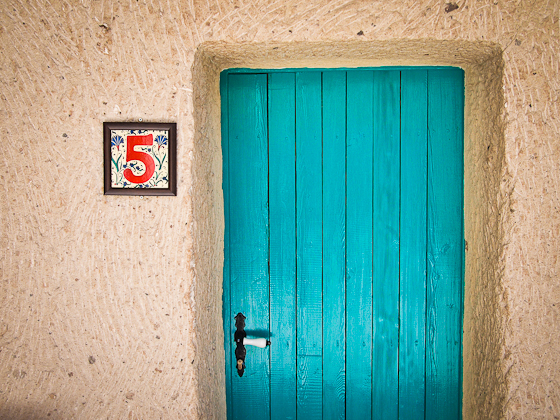 Göreme was no different in these challenges, and the information was far too vague and religiously detailed in spite of having rented the audio guide. Ok: we know where these people worship and we know where they store their food and bury their dead. But where do they actually live? 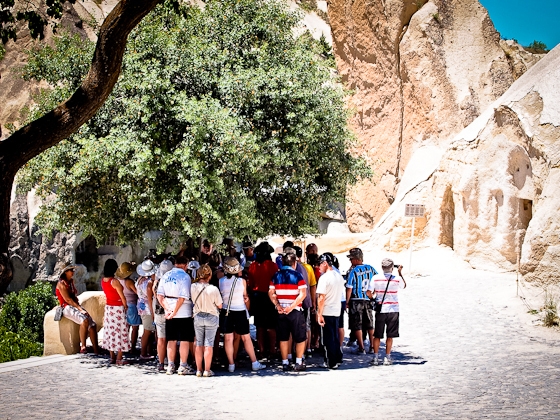 There were so many churches, honestly nearly every site within the Göreme open-air museum is a church. After leaving the open air museum we decided to walk the 3km back to our hotel instead of getting a taxi. 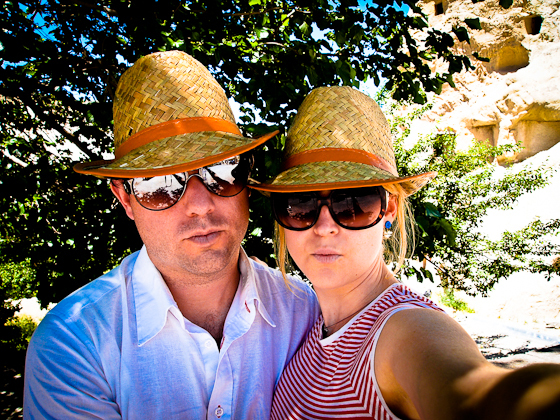 It was very hot but a beautiful day and we loved our walk (thank goodness we had the stupid hats). 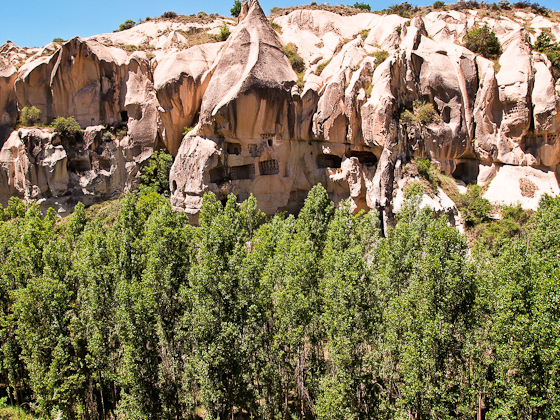 We got a fantastic view of Göreme's valley and there were no other people anywhere to be found, which was blissful. We detoured on the way home and so ended up walking a fair bit longer, and got slightly lost but in the good way. 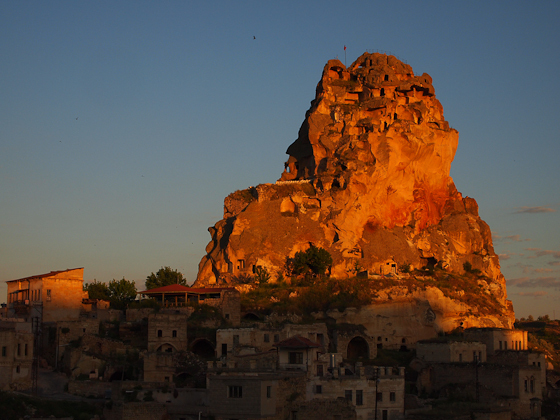 Eventually we found our way back to our village, stopped for lunch and some fresh cherries and then made it back to the Hezen, where we vegetated blissfully for the rest of the day and watched the sun go down over the castle on our last night in magical Cappadocia. We were a little slow feeling but rapidly perked up during the incredible breakfasts offered by Hezen. Every day they have something different that's been freshly baked by one of their staff: pastries, breads etc. We'd had no idea just how many things there are to see and do in the region - plenty more than could be fit into the 3 days that we'd be there. This post is probably tedious and long because for my own memories I've chosen to note them all down. On the suggestion of one of the managers at Hezen we hired a taxi who would take us around for the full day for a set fee. His name was something that sounded like Oor, he could speak barely any English, he had a big belly and an even bigger moustache, and he smiled a lot. It worked out perfectly. 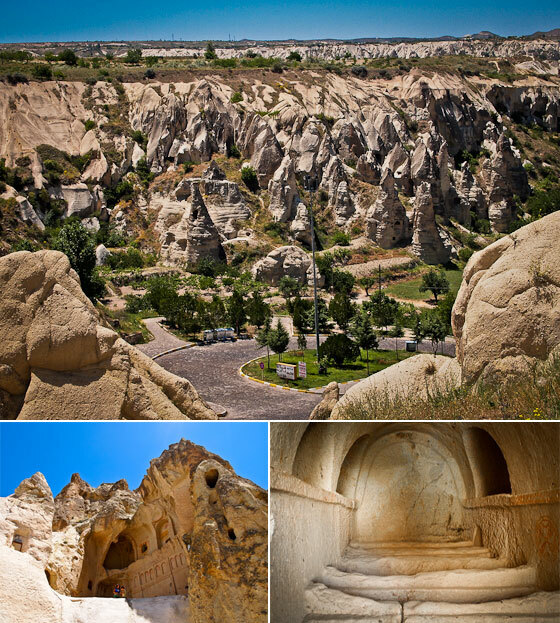 First stop was one of Cappadocia's three underground cities. 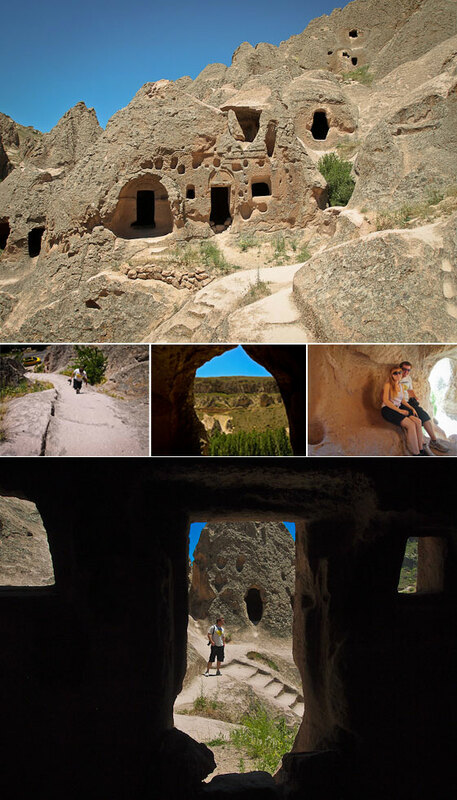 It is called Kaymakli and was built somewhere between the 6th and 10th centuries. There are apparently 7 or 8 floors, not all of which have been discovered yet (not sure how they know of those floors if they haven't discovered them yet though). The entire thing covers 2.5 kilometres which is quite a feat when you think about when they were digging it out. Next stop was a remote collection of cave churches up on a hill. We had to climb a very steep, slippery and scary set of steps to get to them. I haven't been able to work out what place this was. There wasn't anything else around here and we'd never have spotted the steps had the taxi driver not stopped and gestured for us to climb them. He just parked off in the shoulder of the road and waited there for us. Third stop was a contained, protected valley called Soganli. There were six churches in this valley with a total walking distance of 2km between them. When we were dropped off by the taxi while he parked off and napped under a shady tree we were somewhat taken aback. Holy crap! You want us to walk 2km in the ridiculous blazing heat (35 degrees) to see 6 of the same thing?!. But we did it. Scott wore his jacket over his head for protection. We went to all of them, except for one called Snake Church. Which was strange because in between Snake Church and the next one we encountered an actual snake. The universe's way of reminding my conscience to ignore the heat and not be apathetic about the phenomenal structures we'd come all this way to see. 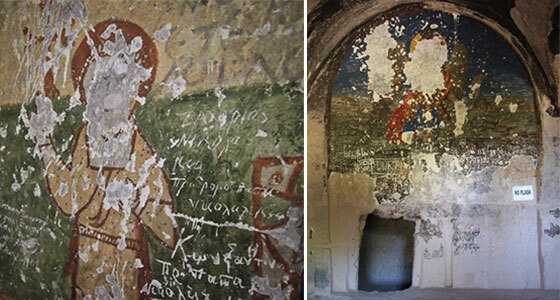 All of the old churches in Cappadocia that have wall and roof paintings inside them ('frescoes', which is a term I'd never encountered before this trip) had been deliberately vandalised. The churches and artworks were created by Christians. At a later stage Turkey became more Islamic (or as my guide book puts it, 'invaded by Arabs') and within that faith it was regarded as extremely disrespectful to depict holy figures like Jesus and Mary, so the faces on all the artworks (and sometimes hands and more) were scratched out. Other than the defacing, the artworks preserved quite well within the caves when you think about how old they are (more than ten centuries old sometimes), and the fact that they're partially exposed to light, extreme cold in winter (it snows and gets to -35 degrees Celsius) and extreme heat in the summer (35+ degrees Celsius). 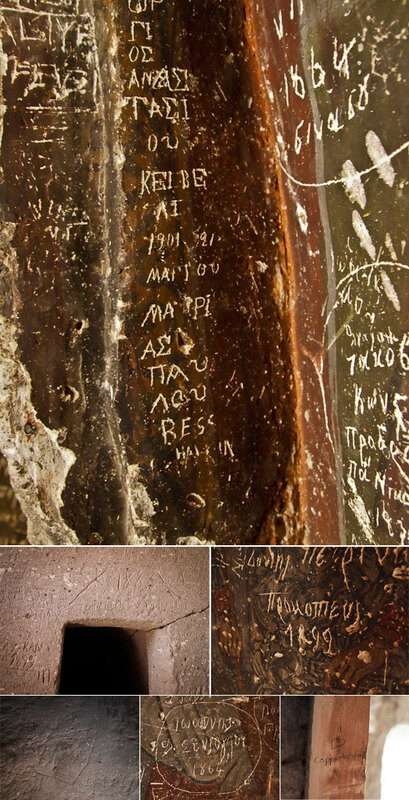 Also inside the caves, to my delight, was hundreds-of-years-old graffiti, alongside modern-day current graffiti. I guess people haven't changed much over time and still seek out the thrill of writing their name and a date on a building. At first we were wondering if the dates on the graffiti was real but after seeing enough of it we were certain that it was. Also, the styling of certain of the characters seemed to imply that they were from a different time (look at the number 9 in the example dated 1901). Funny to think that Johannesburg was not yet even founded when some of this etching was done. After suffering the 2km walk in the blazing heat (I realise how pathetic this sounds. But I swear… there were hills. And it was the middle of the day. And it was hot, very hot. 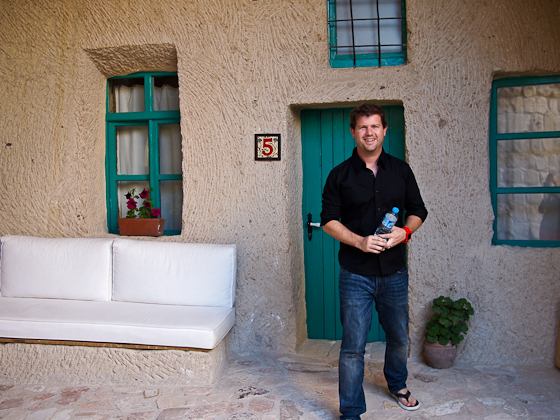 And we'd walked a LOT in Istanbul) there was a small cave village we came to on the side of a hill. These same old structures that we'd been peering into, these people were living in. There were goats, and little patches of farm, a bee apiary and some small kids who stared us down like we were aliens, and then belted out, "Hello!". Lunch was in a restaurant just outside the entrance to the valley named "Cappadocia Restaurant". A name like this has made it tricky to search for online. I did find one lonely picture of a crate of apples though, and a review by someone who like us, found it to be unexpectedly incredible. 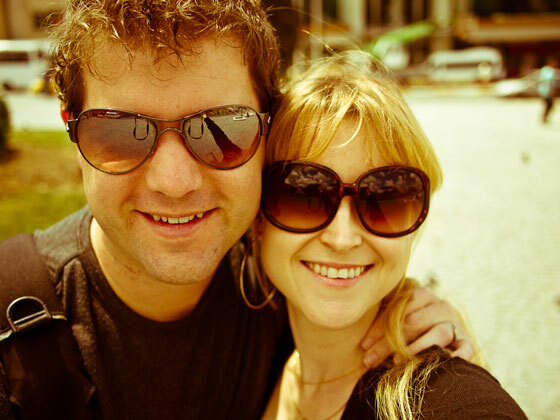 It is run by a husband and wife team. Our table was set up outside in their apple orchard under one of the trees, and nearly everything that we ate had been either grown, made or harvested by the owner and his wife. The bread was fresh baked - crisp on the outside and soft and warm on the inside. It was served to us with cheese made by his wife with milk from their cow, and honey harvested from the apiary I mentioned before. I had wondered if it was goat's cheese before tasting it, and the owner explained in quite broken English that when their cow decided to come home once a day or so (apparently this is a free-range cow :P) his wife would milk her and make cheese and butter. Definitely by this point in the day we were feeling saturated, but since we had a chaperone in the form of Oor there could be no sight-bunking. 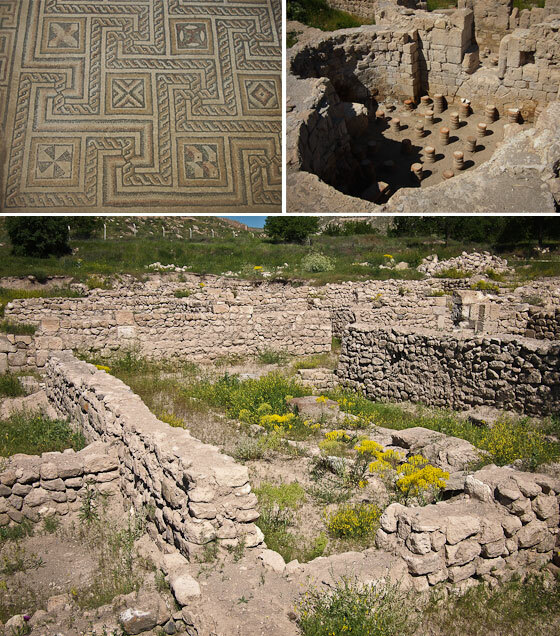 So off we soldiered to the antique city of Sobesos, a group of structures that a farmer accidentally discovered on his farm in the sixties and began excavating himself, which turned out to be from the 4th to 5th centuries AD. We were finally relieved of our sightseeing duties, and collapsed in a pile staring at the ceiling back at our hotel. Finally we pulled ourselves together and freshened up and went for a super meal at Ziggy Cafe, also recommended to us by the manager at Hezen, and the food and service were incredible. A very full, overwhelming, exhausting and wonderful day. Huge excitement. Today we left Istanbul for Cappadocia. I had no idea what was in store and it turned out that Scott had a few more surprises up his sleeve. Our flight was on Turkish Airlines who claim to be Europe's best. The flight was largely uneventful (though delayed 1.5 hours), except for that when we went through security there was one person carrying a mini gas barbecue as a carry-on item. As if that wasn't strange enough, they actually allowed it. In Cappadocia we caught the shuttle to our hotel. It was a minibus and filled with other people all going to different hotels. We hadn't realised it but it would be an hour and a half trip to our hotel, about the same time as our flight. I'd dozed off, and Scott woke me up to tell me that we were getting close to the hotel. When I opened my eyes it was as though I was in some kind of a bizarre dream and I will never forget that moment. We were completely surrounded in every direction by strange rock structures and caves. I had imagined that one would have to visit one particular region to see the sights, but they were absolutely everywhere around us. We were the second to last set of passengers to be delivered to our hotel. We'd watched everyone being dropped off one by one. The first couple were dropped off at a really luxurious looking gorgeous hotel, and the accommodations seemed to get steadily more 'basic' looking with each new person we dropped off. I'd always assumed that we would be staying somewhere hostel-like. I could not have been more wrong. To get to our hotel, the minibus had to navigate down a very steep, crumbly, crappy little road. Eventually when the hotel was in sight he wouldn't drive any further for fear of not being able to get out again. My expectations for our hotel were lowering with each passing moment. Maybe this wouldn't be all bad after all. The reception area behind that front door was magnificent. Unbelievably, Scott found this hotel via my Pinterest board! Talk about a guy who pays attention. I'd pinned a photo of the exact room that we stayed in! Before we were shown to our room, the manager spent a little time doing a welcome / orientation / suggestions chat with us and explaining our sightseeing options and suggested that the best would be to hire a dedicated taxi driver for a day, which we ended up doing. With apologies to the lovely Timamoon where we went for our engagement, this is the most incredible, unbelievable place that I've ever had the privilege of staying. This was a thing happening to me that would never happen to me or any real people I know, an experience reserved for other privileged people on the internet whose lives I like to daydream about living. The moment that we stepped into our 2-bedroom cave I was so overwhelmed, amazed and in disbelief that I got a little teary and I'm feeling the same way right now as I'm re-living that moment while I'm writing about it. 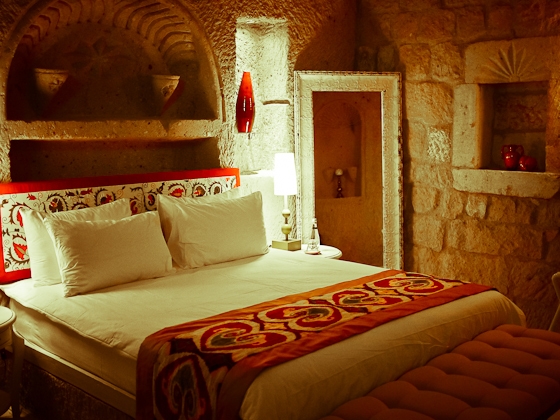 The Hezen Cave Hotel is a tiny boutique hotel with just ten rooms. 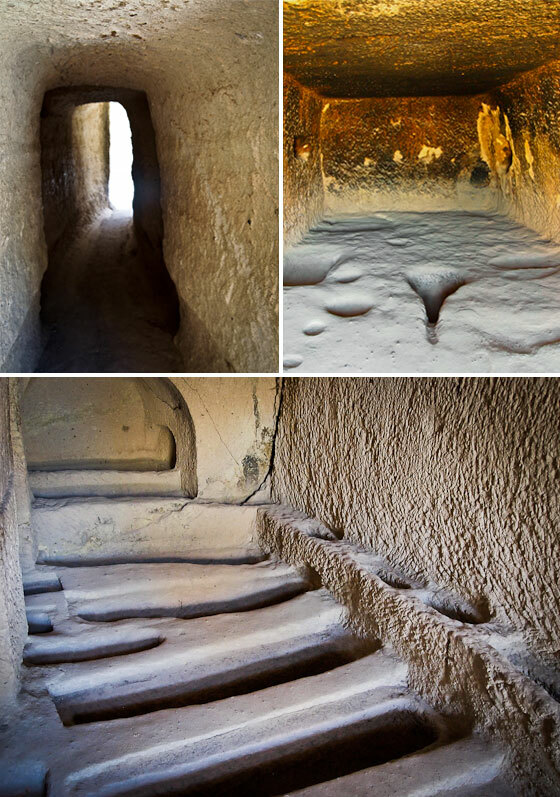 All of the rooms really are actual caves that were carved out over a thousand years ago and are still used today. It is a difficult concept to come to grips with when you're sitting in a room of sheer luxury. Don't be misled by the word 'cave', which conjures up images of dark dankness. Everything at Hezen was bright and light and airy and there was not a single comfort lacking. The decor was incredible and so perfectly and tastefully done. They'd used traditional Turkish elements in the design together with contemporary touches in exactly the right proportions. Added to that, the breakfasts were fresh and indulgent, and every single member of staff was warm, friendly and welcoming and made us feel completely at home and relaxed with perfect hospitality. It is amazing and mind-boggling to see modern people still inhabiting these incredible ancient caves that people carved out so long ago. Entire villages have made their homes in these places and have them plumbed and fitted with electricity. Cappadocia is a very special place. I can't express just how amazing this experience was and how beyond lucky I feel to have the Scoddy that I have <3. Scott wears a tiny device called a FitBit. It is a detailed tracking device and tells you just how far you've walked. Thanks to this we knew that on Thursday we walked 14km, and on Friday we would hit the 14km mark for a second time. Both days were intense. We started off our Friday with a leisurely get-ready and then broke our no-internet rule and called our dear friend Sal for her birthday. It was a good, gentle start to what would turn into a very hectic day of being tourists. 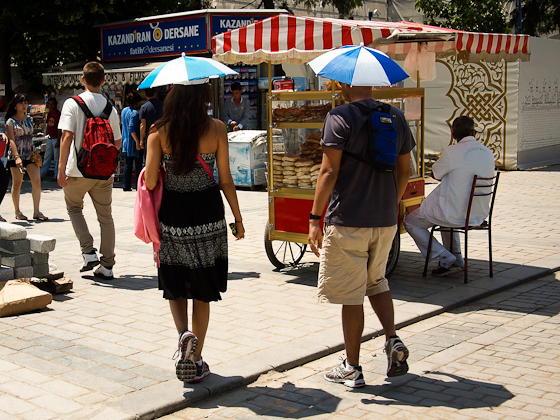 We'd resolved to see and do every single thing in Istanbul this day. Our journey began amusingly. We'd purchased tokens for the tram and promptly pushed through the turnstiles in the wrong direction and had to come back out again and buy a new set of tokens to head in the direction that we actually wanted to go. First stop: Hagia Sophia. My travel guide for Istanbul lists this as a must-see for being 'one of the world's greatest feats of architecture' but we would happily have given it a skip had we known the mess of queues, touts, tour guides and con-artist simit salesmen that we were about to face, all in thirty-something degree blazing midday heat. By the time we made it inside we were both so agitated that we each wanted to find a separate corner somewhere, curl into a foetal position and hum something monotone. I am glad that we suffered through it though because it turned out to be spectacular. 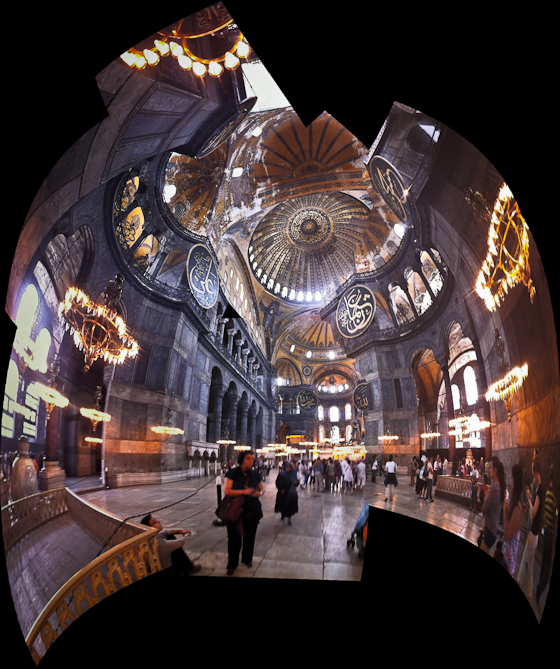 One should respect Hagia Sophia because it is very, very, very old. Verrrry old. We're talking like 360 AD old. 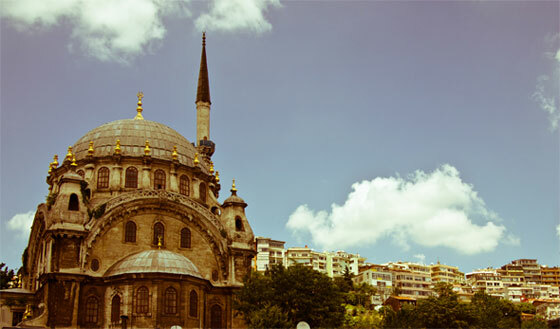 It began its life as a Greek cathedral, then converted to a Roman cathedral, and finally into a mosque from 1453 until 1931 when it was then secularised. Hagia Sophia inside is mainly one large hall. Because of the size of the building and how wide across and high up it goes, it was tricky to take pictures of. I attempted to get a panorama using the Photosynth app on my iPhone that Charles showed us (which, oddly enough, is made by Microsoft). The result was bizarre and jagged (I suppose this takes a little practise and a novice like me should not have attempted to snap this entire hall) but I love the picture that came about! The truth is that we made fun of them, but those two got the last laugh. It wasn't long before we were about to melt into an ugly stinky puddle from the extreme heat, and were plotting ways that we might be able to temporarily stun them and steal their hats. The Turkish sun is no joke. Our arrival at the Blue Mosque coincided with prayer time and so we weren't able to enter. It is amazing to see something so ancient (this one dates from 1616) still in use today, and according to Wikipedia the building has a capacity of 10 000. We peeped in to see what prayer time looked like but were forbidden from taking any photos. On the outside area there was a series of taps where people could wash their faces, hands and feet before going in to pray. 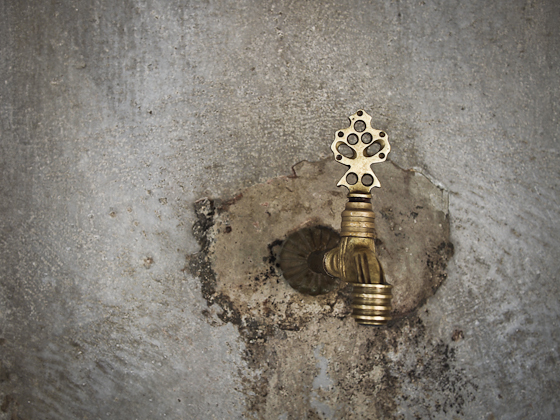 The taps are really ornate and beautiful, and similar ones are installed throughout the country. Next stop: Grand Bazaar. I have to say that I was nervous about this one and the effect that it might have on Scott's fragile tolerance for confined spaces filled with people and vendors all pushing and yelling, and shopping (especially after the chaos at Hagia Sophia). This market was an amazing thing to behold though. It is the oldest and largest market in the world. 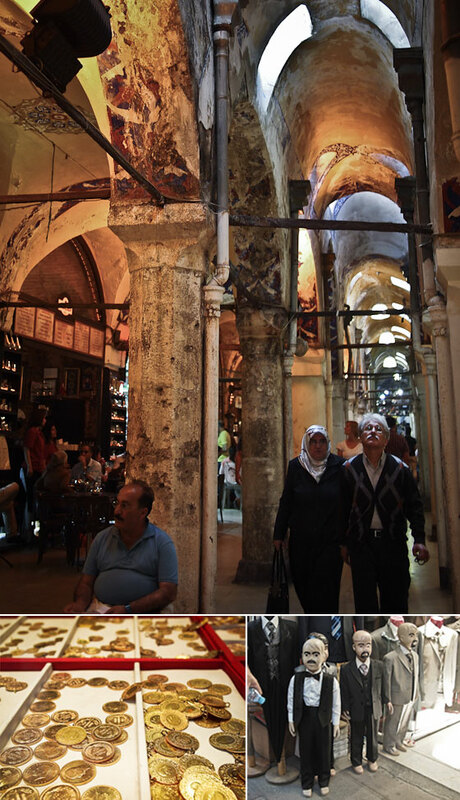 It opened in 1461, has over 4000 shops, 58 covered streets and attracts between 250 000 and 500 000 visitors per day! You can buy all things Turkish here, and most notably boat-loads of gold! We didn't buy anything (especially not anything gold) because apparently everything is marked up for tourists in the Grand Bazaar but it was fun getting lost and wandering up and down the tiny alleyways. We decided to hit up the Spice Bazaar next. I was a complete mess by the time we got there, because like a fool I had decided to buy a mielie (corn on the cob) from one of the local street vendors and it turned out to be the stickiest messiest vegetable I have ever eaten. I have never known a mielie to be so damned sticky and messy. They cook them over an open fire and they look and smell delicious, but this is one mistake I will not be making again. The thing managed to cover me the whole way down my front, and it took me hours to get the bits out of my teeth, clothing and hair (I don't carry dental floss around with me when I go walking but I think now I will) and tainted the flavour of the freshly made Turkish delight that we tasted in the market. He was very nice about it but I'm sure Scott was even embarrassed to be seen alongside me. The Turkish delight in Turkey is nothing like what we in the west know Turkish delight to be. 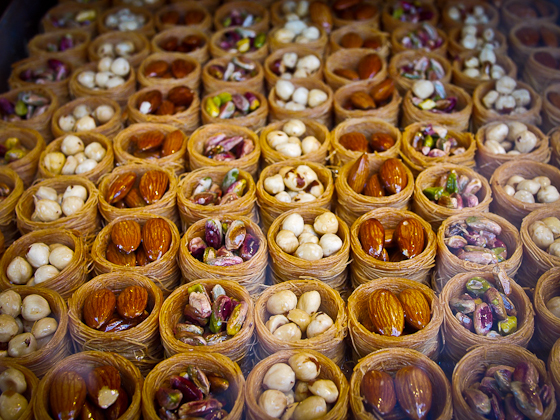 It has more of a nougat-like consistency and often has whole pistachios and hazelnuts in it. We bought a few pieces thinking that they would tide us over for the rest of our time in Istanbul but they did not even make it out of the market. They come in 'cakes' of fresh made candy, and you select the flavour that you want (for example they had pomegranate, hazelnut and coconut, or regular pistachio) and tell them how much you want and they sell it to you by weight. After the Spice Market we walked to the extremely grandiose bridge that crosses the Bosphorous River. 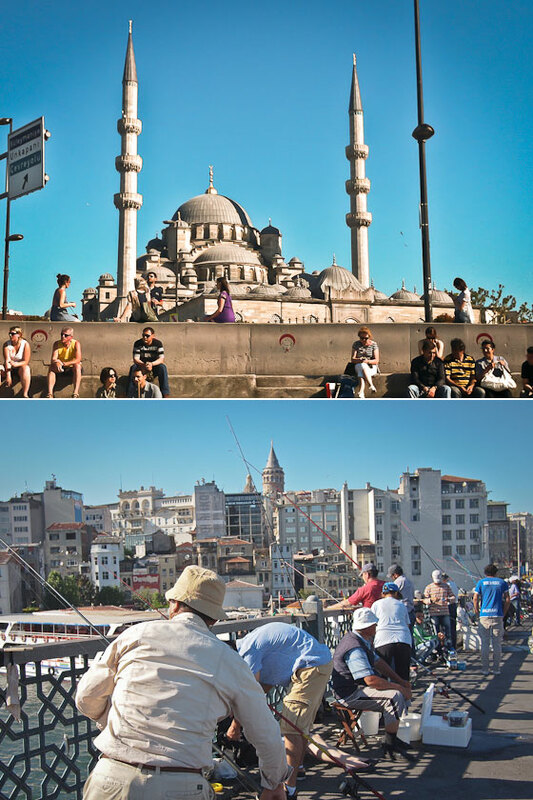 My Wallpaper Istanbul City Guide claims that this bridge and general region has been compared to Montmartre in Paris. The odd and interesting thing about it is that even though there are tonnes of boats carrying tourists and who knows what else (cats, perhaps?) under it, there is a huge contingent of fishermen fishing down off the bridge into the water 1000 metres below. And I say fishermen in the most literal sense, because there was not single female fishing. A lot of these people were dressed as though they had stopped to cast a quick line in on the way home from their office jobs. More walking back towards Taksim Square which is near our hotel, and on the way up the shopping walking street connecting to it, we inadvertently got caught in a gridlocked crowd of protestors, and there were millions of riot police everywhere. Amazing how it really came out of nowhere, and it was quite a panickey, scary experience. Eventually we were able to remove ourselves from it and slip into a side street where we bolted back to our hotel as quickly as we could. We still have no idea what was going on or what any of it was about, and there were really a terrifying amount of police all wearing full riot gear and brandishing large weapons that they kept their fingers on the triggers of. Back at the hotel we were completely wiped out. We'd planned to use the hotel's jacuzzi, Turkish bath and sauna again but we collapsed in a heap and passed out. I'd call day 3 a success. First full day in Turkey, and by now it had properly sunken in where we were which caused me to bolt out of bed with excitement really early. Scott had barely slept on any of our flights (I'd slept a whole lot) and I killed time waiting for him to wake up by writing a blog post. Our first plan for the day had been to try out some of the Turkish coffee that we'd often heard about, supposedly guaranteed to wire you better than any other legal substance. 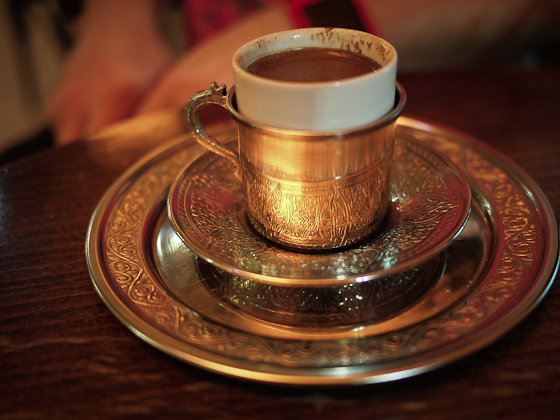 We'd apparently miscommunicated what we were looking for when we asked the hotel porter where to find this, because when we got to where he'd directed us it turned out to be a crappy local chain called Simit Sarayi and the latte that I ordered was thimble-sized, weak and watery. But not enough to dampen my spirits! Scott got a simit (sesame seed bagel) which seems to be a local staple and the simit vendor is to Istanbul what the hot dog vendor is to New York. 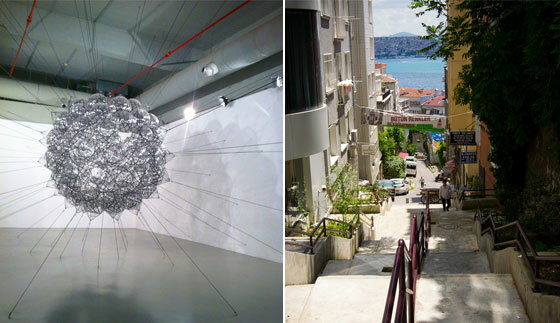 We'd decided to visit Istanbul's modern art gallery as a first activity, and chose to walk there instead of using transit. This city is not only scenic. This city is filled to bursting with free cats! Cats are everywhere! 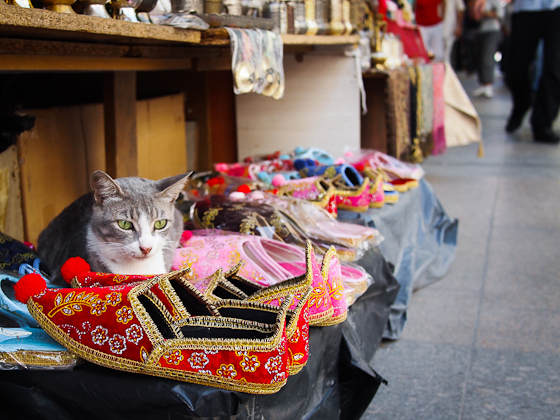 Even though they are nearly all ferrel and rather scrappy looking, they are friendly and will give you a whiskery smile and a miao when you walk by. People's reaction to the cats is interesting. In any other place I could imagine them being regarded as pests since there are so many of them and they don't belong to anyone, but Istanbulites often here stop to talk to the cats and pet them, and put out little dishes of food. Istanbul Modern did not disappoint. It was a perfect size. We managed to make our way through every one of the exhibits without collapsing in an exhausted heap afterwards - perhaps a first. They had some fantastic installation work, lots of video pieces and they even had an elaborate work with 2 drawings and some sort of a kaleidoscope by South Africa's William Kentridge. I didn't get to look at it properly though because it was being hogged by a group of museum-visiting Turkish men. On our way home from the museum we gave in and sat down for a predictable Starbucks coffee and a solid dose of silent people watching. 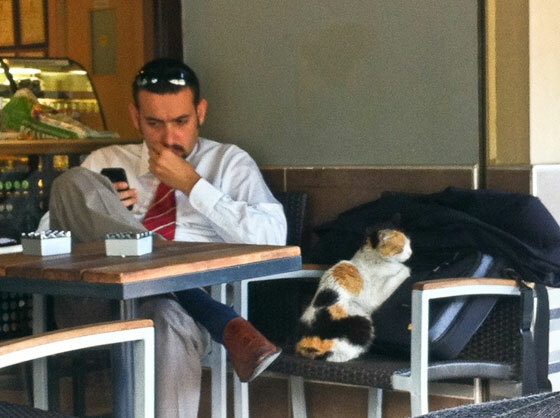 I stole a shot of this Starbucks man with the cat companion who adopted him and melted down his laptop bag. More walking back in the direction of our hotel and I was able to sneak in a little shopping. It seems that in Istanbul, you cannot go wrong with red. I have never seen more people wearing red and it always looks absolutely striking. I've been wanting a pair of red pants for a while now and was excited to pick some up from the Mango here where they had 5 styles of red pants to chose from. On our walk back home we turned into a really peculiar part of town. We haven't been able to figure out why, but it is an entire abandoned neighbourhood and in a prime part of the city. The more we tried to get away from this ghost town, the deeper in we seemed to get and the empty buildings were peppered with dangerous looking cats and children. Eventually we got past it and found ourselves in dodgeville, and it felt like we were seasoned fresh meat being dropped into a pit of hungry hounds. The eyes and heads of every local followed us as we walked by and we were feeling quite unsafe, though we have no idea whether or not we actually were. 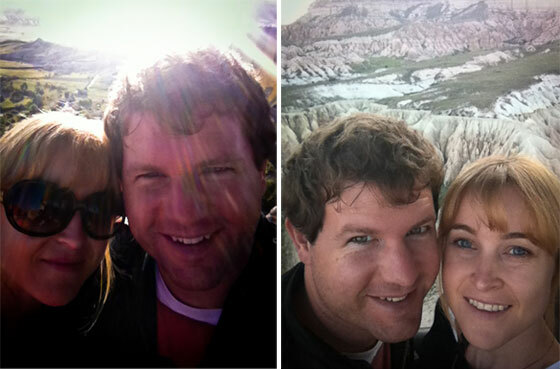 Either way, we were definitely more conspicuous than we'd liked to have been. The final walk out of dodgeville was up a large and very steep hill which our unfit selves were only able to make it up thanks to a dose of adenaline. Back in our hood Scott decided to take off the edge with a food item that really should never be allowed, but is to be found all over the place here: a french-fry filled hot dog. Our hotel in Istanbul was very fancy and came with a heated indoor swimming pool, a jacuzzi, a Turkish bath hot room and a sauna. After we'd gotten home and scrubbed the city filth off, we went downstairs in our cushy robes and made use of every one of them. 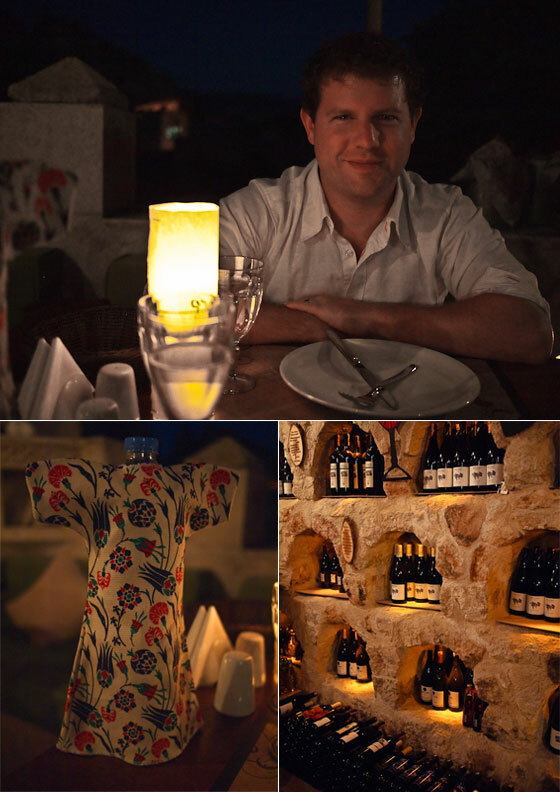 We rounded it all off with some lovely Stoney Brook wine that we'd brought along, freshened up and headed back out for dinner to a place recommended by Time Out Istanbul called Meze by Lemon Tree. The restaurant was tiny and only had about 8 tables. The service and food were both impeccable, and the decor was simple and beautiful with Turkish-style geometric mosaic floor tiles that I could not stop staring at. It is rare that Scott and I visit a place that is new to both of us, and so far this has been an absolutely incredible time. We've been having the best time discovering things and places together. It has been an adjustment doing this all without using our phones or computers along the way to work things out but what we've lacked in preparedness we have more than made up for in adventure.